Lead Liaison‘s revenue generation software has ultra-tight integration with CRMs such as Salesforce.com. Designed from the ground up with CRM integration in mind, Lead Liaison integrates all lead activity (e-mail open/sent, video views, web visits, and more) into the Activity History sections. 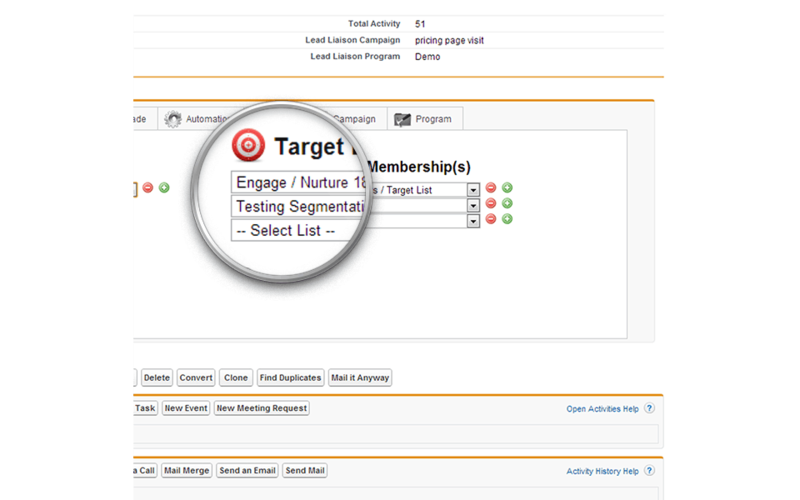 Store a leads web visit history and relevant activities inside your CRM. Automatically synchronize lead scores, activity, and business intelligence information. Import new leads and business intelligence information in a single click. Lead Liaison integrates with multiple CRMs. All versions of Salesforce.com are fully supported with an in depth integration. 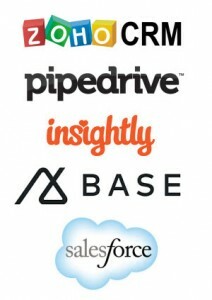 Other CRMs such as Zoho CRM, Pipedrive, Insightly, and Base are also supported. We’re in a digital era, where computers rule and information is everywhere. Buyers have an opportunity to research a company’s solutions online before they ever make contact with a sales person. Unfortunately, sales people are only brought in when the Prospect is ready to buy. With Lead Liaison’s proprietary tracking mechanisms we build a DNA of your Prospects online behavior. Pages they’ve viewed, forms they’ve submitted, videos they’ve watched, emails they’ve clicked. Sales finally has the advantage and their well informed before making contact with the Prospect. High-level lead qualification information such as lead score, lead grade, last visit to your companies website, search terms, total visits and more are kept saved to the Lead or Contact record within your CRM. 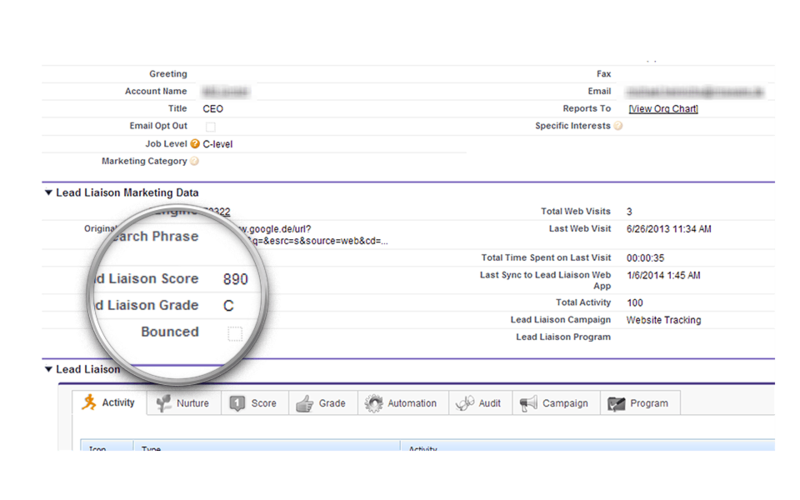 Use your CRM’s reporting capabilities to create dashboards and reports using Lead Liaison’s qualification information. Instead of dealing with a “flat” database where every lead looks the same Lead Liaison provides a hot lead dashboard that highlights your hottest leads. Hot leads are determined by flames. Flames are calculated using the Lead Liaison’s lead qualification engine driven off of Buy Signals, Scores, Grades and several other parameters. Tune dashboard results to your liking with an easy to use admin interface. 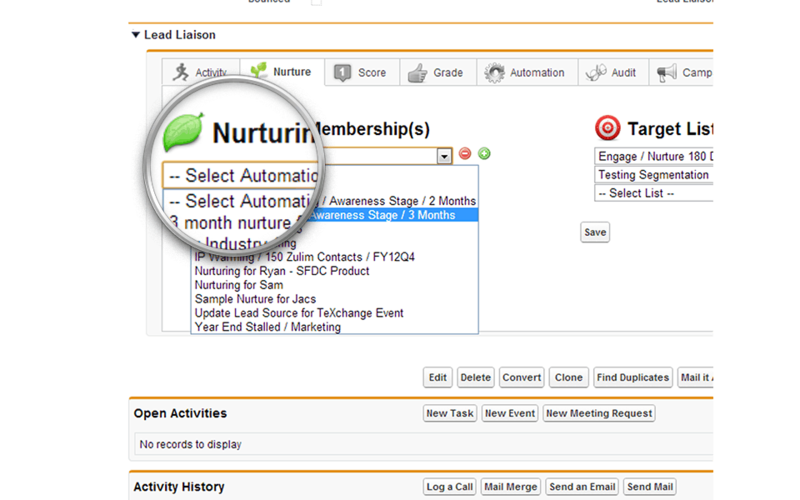 Sales people will love nurturing. It’s the new way to sell! They’ll even love it more when they know they can do it from within their CRM. On the Lead or Contact record sales people can search for pre-built nurturing campaigns created by their marketing department and drop the Prospect into the nurturing workflow. The Prospect will enter the dialogue and receive personalized content from the Lead Owner. 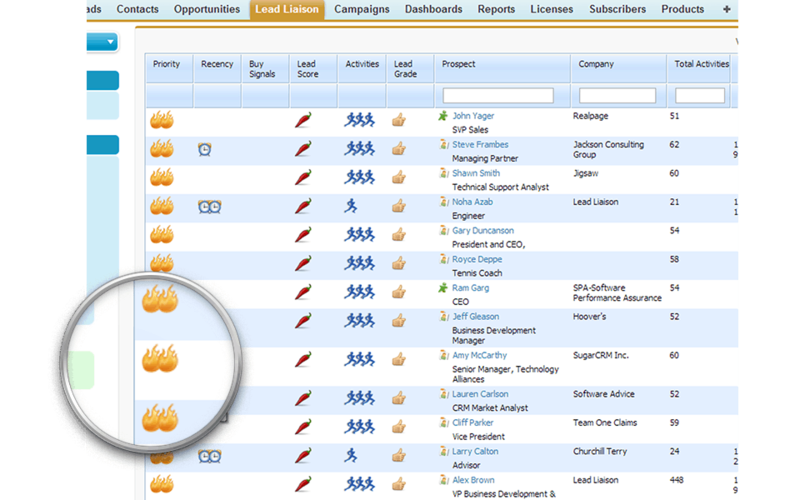 See which lists your Prospects are part of right within your CRM. Add Prospects to a list or remove them off the list. Optionally wrap a marketing campaign around a list. As soon as the Prospect is added to the list they’ll enter your marketing campaign.